Hey Baby, Wanna Check Out My Question of the Week? Or maybe… something even better! So hit me with your worst pick up line. If he means “tethered by a leash” then, possibly. “Wanna give me a hand-job?” I seriously got that one when I was about 12 and didn’t know what it meant. I did know, however that I didn’t want to. Probably not. But I didn’t stick around to find out! He was, as you can probably tell, seriously creepy. “Hey,” he said. “Did you know body language is a language that everyone can read. Can you read mine?” he asked hopefully. I was 17 and he was over 40. I shrugged and said, “I know! What does this tell you?” and walked away. Was that mean? That probably mean. I can’t even remember them all, I was a bartender and shot tournament pool for years. Some were so bad they made me want to retch. It is amazing what men will say with a bit of liquid courage. I did have the Sargent at Arms of the local chapter of the Bandidos once swoop all my balls off the table during a match and tell me ‘little girls’ should play men’s games. He got several stitches for his efforts. “Did it hurt when you fell from heaven?” I think this was the worst pick up line I ever heard! It wasn’t a pickup line as such, but some guy started singing “Sexyback” as I walked away from him…in the middle of a grocery store parking lot. He sounded pretty drunk, too. I haven’t heard a pick up line in decades. Until just recently. I was at McDonald’s with my kids. I had bought a giant sweet tea for myself. As I stood up to leave, this man sitting behind me with a group of other men smiled at me and called out, “Well now! Woowee! That’s quite a big gulp for such a cute little lady such as yourself! Need any help with that?” then he winked at me and his friends all laughed as they all looked me up and down. I’d guess he was about 95 years old. Yup. Still got it. Ha! Darla that’s amazing. You definitely still got it, girl. Being male I’ve never had a pickup line used on me. I guess women know a lame move and don’t use them. I’ve been afraid to use a pickup line because I get enough rejection as it is. Like the entries though. 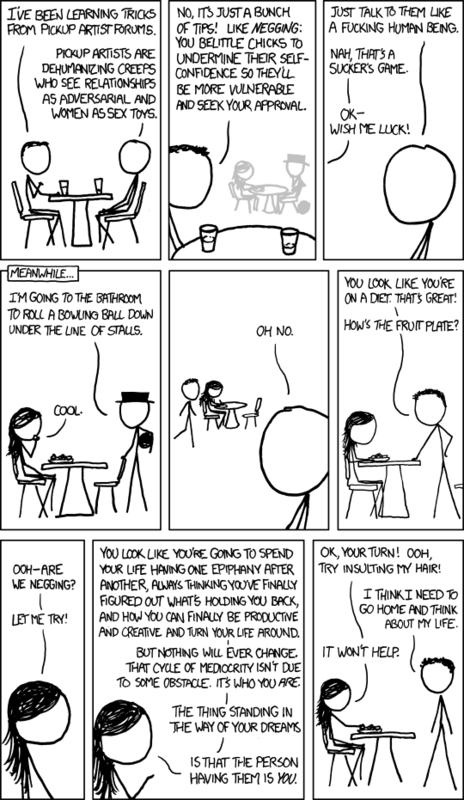 Not the worst, not the most clever and not a laugh riot — but the most common pick-up line I heard in college was always, “Hey, weren’t you in my freshman (insert field of study I’ve never enrolled in) class? !” I apparently took about 20 classes that I have no memory of actually taking — although, if it were my freshman year, that’s entirely possible. I honestly do not know how to judge the worst pickup line, or how to formulate one. I’ve blocked out most of the ones I’ve heard. But here’s a gem I got from a homeless guy across the street from my office once: “I want to be your husband! I love you like hot McDonald’s french fries!” Totally made my day. I was nineteen, of perfectly legal drinking age in England where I was visiting, and went out to a bar with a friend of mine. She worked with race horses and so the bar we went to was a place that jockeys or want to be jockeys hung out. A fellow of short stature came up to me and asked if I had any Irish in me. Being naive and rather innocent I proceeded to tell him of my mutt like ethnicity, which does not include any Irish. He then responded, “Well then, would you like some?” Confused I asked, “Like some what?” With a wicked grin he drunkenly slurred “Like some Irish in ya.” I was so taken a back and disgusted by the thought that I laughed in his face and told him that was a good one but no way in hell that was going to happen – at least with him. Should have run with it and acted like you thought he was buying you a whiskey. Very smooth. Especially with a samba beat in the background. Wow. So he was basically asking, “What’s your sign?”. Yeah, but that was too mundane for him. He wanted me to know I was HOT! 😉 Like I didn’t know that! Reminds me of a girl I knew who said, “I’ve decided that if I were a road sign, I’d be ‘Rocks. '” I was entranced. At a dance club, my friend dropped her purse and when I went to bend down to get it I heard “Hey, while you’re down there” now I’m not sure if that was a “pick-up” line or death wish..my face said death wish, but something tells me the drunk heard something completely different. You asked! Wow, I thought the “While you’re down there” was only the domain of homophobic teenagers when their buddy bends down to tie his shoe. Let me see you in the light. No, we’re good now! They worst was when a guy licked his fingers touched my shirt and said “wanna come back to my place and change out of those wet clothes?” nope. Just reading that caused physical revulsion in me. I always say that every man should get hit on by other men at least once in their lives. Not saying women can’t commit their share of violations, but everyone should understand what it’s like to have a full-on predator get you in its sights. Some guys might change their thinking. Maybe. ULGH! Okay. I think you need to win this contest just to make up for having had to experience that. Back in the day I preferred the take my drink(s) and cower in the corner approach. Here’s one I heard in college, though this did not happen to me. Everything about that interaction is a little nauseating. Hey, baby Byronic Man, how often do you run the Weekly Question of the Week?